Pleasantly aromatic bay leaf or bay-laurel is one of the well-recognized culinary leaf-spices in use since the earliest times. In the legends, bay laurel is depicted as the tree of the Sun god, under the celestial sign of Leo. Botanically, bay tree belongs to the family of Lauraceae, in the genus; Laurus. It is thought to have originated in Asia Minor region, from where it distributed to all over the Mediterranean region and other parts of Asia. Laurel's thick and leathery leaves feature elliptic shape, shiny, dark-green and measure about 3-4 inches in length. Bay leaves (Laurus nobilis). Note for deep green color slightly wilted leaves. Bay leaves give off a pleasing and sweet aroma when added to the recipes. Wilted and dried leaves indeed are strongly aromatic and can be stored for months. Its dried fruit (berries) can also be employed as a flavoring agent in the cuisine. Bay leaf was prized highly by the Greeks and the Romans, who believed that the herb symbolizes wisdom, peace, and protection. The spice contains many important plant-derived chemical compounds, minerals, and vitamins that are essential for optimum health. This spice has many volatile active components such as a-pinene, ß-pinene, myrcene, limonene, linalool, methyl chavicol, neral, a-terpineol, geranyl acetate, eugenol, and chavicol. These compounds are known to have been antiseptic, antioxidant, digestive, and thought to have anti-cancer properties. Fresh leaves are a very rich source of vitamin-C; provide 46.5 mg or 77.5% of RDA per 100 g. Vitamin-C (ascorbic acid) is one of the powerful natural antioxidant that help remove harmful free radicals from the body. Ascorbic acid also has an immune booster, wound healing, and antiviral effects. Furthermore, its fresh leaves and herb parts are superb in folic acid; contain about 180 mg or 45% of daily-recommended values per 100 g. Folates are important in DNA synthesis, and when given during the peri-conception period, they can help prevent neural tube defects in the newborn baby. Bay leaves are an excellent source of vitamin-A; contain 6185 IU or 206% of recommended daily levels per 100 g. Vitamin-A is a natural antioxidant and is essential for normal eyesight. It is also required for maintaining mucosa and skin health. Consumption of natural foods rich in vitamin A has been found to help to protect from lung and oral cavity cancers. The spice is indeed an excellent source of many vitamins such as niacin, pyridoxine, pantothenic acid, and riboflavin. These B-complex groups of vitamins help in enzyme synthesis, nervous system function, and regulating body metabolism. This leafy spice is an excellent source of minerals like copper, potassium, calcium, manganese, iron, selenium, zinc and magnesium. Potassium is an important component of cell and body fluids that helps control heart rate and blood pressure. Manganese and copper are used by the body as co-factors for the antioxidant enzyme, superoxide dismutase. Iron is essential for red blood cell production and as a co-factor for cytochrome oxidase enzymes. Essential oil from the bay leaves contains mostly cineol (50%); furthermore, eugenol, chavicol, acetyl eugenol, methyl eugenol, a- and ß-pinene, phellandrene, linalool, geraniol, and terpineol are also found. The components in the essential oil can also be used in many traditional medicines in the treatment of arthritis, muscle pain, bronchitis, and flu-symptoms. Bay leaf (Laurus nobilis), Nutritional value per 100 g.
(Source: USDA National Nutrient data base). Traditionally, bay leaves are picked and dried slowly under the shade away from direct sunlight to retain their volatile essential oils. In the spice stores, one might come across different kinds of bay leaf preparations. Completely dry, and ground (spicy powder) forms can also be sold in such stores. Buy from authentic sources and avoid those with off-smell, spots, or fungus-inflicted leaves. Once at home, store bay leaf in airtight jar or container and keep away from direct light. Since they lose flavor early, laurel leaves should not be kept for longer than a year. Dried bay laurel berries are also being used as a flavoring items in dishes. Glossy, dark-green bay leaves can be used fresh. However, they are at their best after being allowed to wilt under the shade for few days till their bitterness has gone, but the leaves still retain their pleasing aroma. If you stumble upon bay leaves in the cooked food, just keep them aside before eating. Besides being quite strongly flavored, the laurel leaves are leathery in texture and tough to chew and swallow. Bay leaf is one of the ingredients in bouquet garni along with thyme, sage, savory, celery, and basil. Its dried leaves brewed into an herbal tea. Popular as tej patta, dry laurel leaf always found a place in the kitchen spice-box in India. The leaf added to flavor fried-rice, biriyani, chutneys, etc. Bay Laurel is also an essential ingredient in many classic sauces such as bread sauce, tomato sauce, and béchamel. Bay leaves added to flavor cuisines such as seafood, poultry, meat, rice (pulov), and vegetable dishes. 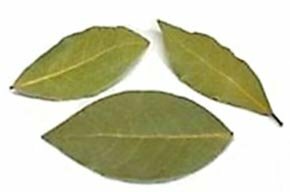 Bay leaf used to flavor sweet dishes like sweetbreads, custards, and creams. Discard Laurel from the food before serving since they may cause choking, may cut tongue and injure digestive tract. Pregnant women should avoid eating them in excess as the chemical compounds in them may cause abortion. <<-Back to Spices from Bay leaf. Visit here for an impressive list of healthy spices with complete illustrations of their nutrition facts and health benefits.